Last night’s run was another really good one! In May the weather got really hot here in south Florida and my pace started to suffer a little bit. It was kind of bumming me out a bit even though I know it’s not a big deal. After the run I got in some chest, shoulders and back work at the gym to cap off the night on a really good note. Adam tried to make me do an unassisted pull up, but it’s just not going to happen. He says he knows I can do it, I just have to believe… hah! I don’t know about that. One day I will do it. I just don’t think it will be anytime soon! 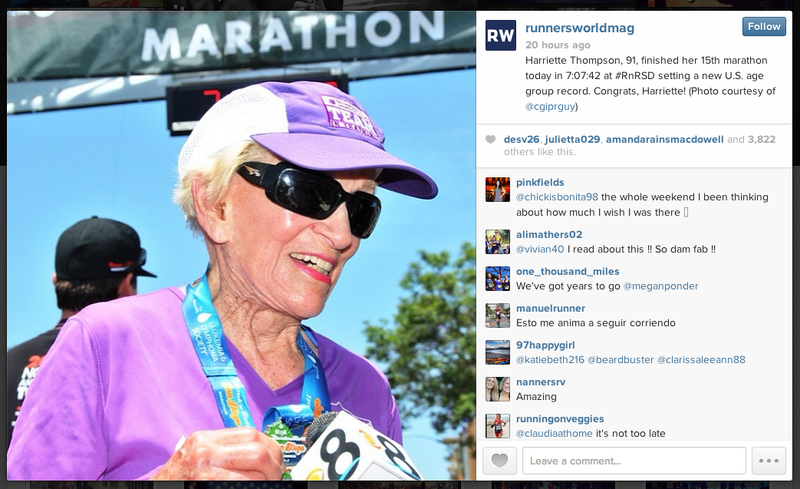 Did you see what Runner’s World posted to Instagram over the weekend? Harriette Thompson, 91, finished her 15th marathon on Sunday setting a new US age group record in 7:07:42 at Rock N Roll San Diego! That’s 16:19 minutes/mile pace. I think Harriette looks quite young and full of life in the picture. I really hope my legs still want to carry me over that kind of distance when I’m in my 90s! NBC Chicago interviewed Harriette and she told them, “my favorite part is at the end when I get over the finish line. That’s the best part!” Love it! I hope to still be running at 91, and to be able to do a pull up. Can you do pullups? How many in a row can you do? Did you like playing on the monkey bars as a kid? Previous Post I did it: my first 90+ mile month! Next Post My two year run-aversary! Good runs just feel great don’t they? How it stays cloudy all summer for you lol. I’m with Adam, I know you can do unassisted pull ups. It’s one of those things that once you get the first one, you’ll be doing them like nothing. Wow harriette is amazing, I hope I can still be running at that age. I haven’t been to the gym ina while but in sure I can do a few pullups. May have to try it just to find out. I don’t remember being especially fond of monkey bars as a kid, merry go round was more my danger level. I don’t know about those pullups… so hard! If I had to choose between doing one pullup or running 10 miles, I would take the 10 miles any day! I LOVE the fact that Hariette raced at 91–marathon! I have so much admiration and respect for her. You had a cool run at 80…I told my husband when I got back from running today that I survived my first “hot” run of the season…to my dismay, it was only 73. It’s all relative! Harriette is amazing, especially since she recently had radiation on her legs for cancer and raised $90K for the Leukemia and Lymphoma society through Team in Training!! I hope I’m not only running but giving back to the community like that when I am her age! Wow Harriet is gorgeous! I will feel extremely lucky if I can run at all when I’m 90, let alone run a marathon. I know you are really strong, so I am pretty sure you could do a pull up! Right now I can do 3. I use the assisted pull up machine for training and when I attempt do do an unassisted one, it’s the first lift I do so that I have all my strength. If I saved them for the end of the workout, I don’t think I’d be able to do one! I’m going to make it a point of focus and hopefully I’ll be able to do one soon! Currently, no, I can’t do any unassisted pull-ups. The only times I’ve ever been able to do them are when I do P90X – about halfway through the program I build up to a couple – I think 4 or 5 is my record without help (a stool). I am RUBBISH at pull-ups I think. I haven’t tried to do an unassisted one since I was a teenager living at home and my older brother got one of those pull-up bars fixed into his doorway. I do like a playground though. There are some bars at thye edge of the school’s track, maybe I should mix it up a bit and give it a go?? Yes, absolutely! I think we should plan to run a race somewhere exotic in a younger decade than the 90s though. I would hate to meet you at the starting line and then forget who you are by the time I reach the finish 🙂 haha. I love the story about Harriette 🙂 That is who I want to be! That seriously amazes me! Cheers for clouds lol Good job picking up the pace and working your muscles still. I can’t do a pull up ever, i have tried, my gym buddy that pushes me says I will get string enough one day to knock one out, we’ll see lol Lately I haven’t even used the assisted machine, because my shoulder was irritated, but I think I am past that now. Keep working, I am…maybe we will do it one day!! We WILL get strong enough to do it one day! tonight it was totally cloudy and i should have gone running! i just can’t get myself out the door. ugh. glad you took advantage of the clouds while you can! To be honest, I have no idea if I can do a pull up! LOL. I haven’t tried in years…for real. I’m super curious so I’m tempted to try when I reactivate my gym membership in a couple of weeks. 😉 I have no idea how you run in those temperatures! I live in Nova Scotia and it doesn’t get near the heat and humidity that you get in FL. Summer miles make fall smiles! 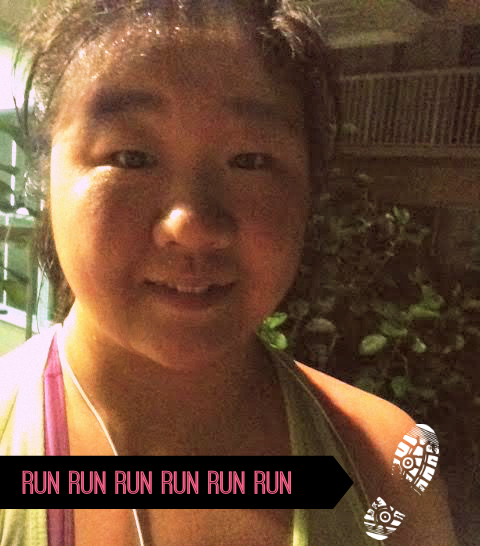 It’s sooo humid right now, but we’ll be speed demons in the fall!